Lemme preface this by saying that Princeton Theological Seminary has been a liberating theological environment for me. A year ago, when I first moved out here to begin my seminary journey, I remember feeling so free, simply in the fact that I could use theological language without "losing" anybody. But aside from that, because of the diversity of theological backgrounds represented by the various members of this community (everyone from Pentecostals to evangelicals to liberal mainliners), there's a lot of freedom here to express and wrestle theologically with ideas. That being said, it is still Presbyterian... and more specifically, it's Barthian. While the theology faculty here is almost as diverse as the student body, there is a collection of scholars here who specialize in the theology of Karl Barth. You can't get through seminary at Princeton without hearing something about Barth... and it's even less likely that you'll get through it without coming across a few people who are enthusiastically... lets just say it... obsessed with his theology. 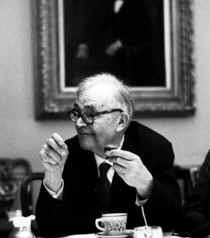 For those of us who didn't come here specifically to study Barth, and especially for those of us who are inclined toward process theology and various political theologies--liberation theology, feminist theology, etc.--it can be quite a turn-off to find such enthusiasm around one guy's perspective. It's kind of unfortunate that in this environment, you either have to love Barth or you'll probably hate him. It's unfortunate because, no matter where you stand, he's an important voice. Now, this might seem strange coming from me. It's no secret that I've got my own go-to theologians (namely, Jurgen Moltmann). But what I've learned in this polarizing Barthian environment is just how important it is not to get too ideologically married to one or two people's thoughts. After all, Christian discipleship is about following Jesus, not Paul or Apollos (see 1 Cor. 1:10-17). In order for there not to be such ideological divisions in us, we have to learn to listen to each other--to take the best and leave the worst from everyone, those we love and those we hate, from Barth and Tillich alike. In the last year I went from liking what little I knew of Barth, to being annoyed by him, all the way back to where I am now. I can now say that I like Barth. I really do. The overdose has not killed me. When I sit and read Church Dogmatics I'm not uncritical of its issues, but I learn... I learn a lot and am even able to be inspired. Sometimes very inspired! Yes, I still like Tillich, I still love Gustavo Gutierrez, and I have a crush on Jurgen Moltmann, but Barth is right there in the mix. So this is my advice.... don't be too decisive about which theologians you like and don't like. Don't too quickly marry yourself off to one camp or another. Don't preclude yourself from learning from, even being inspired, by sources outside your usual. Be open and charitable, always seeking to broaden your spectrum in dedication to Christ.